Due to poor internet in Uruguay our blog posts will be delayed for about another week. Amanda writes: We’ve got what I consider some exciting blogs in the draft section. We’re thrilled to share more beautiful pictures and fun stories once we can add pictures. Right now that is proving difficult with internet. So in the meantime I’ll share a little story. In 2015 I was invited to speak at a https://www.womentumwyo.org event. This is a group whose vision is to inspire confidence in women to meet their full potential. They empower and connect women to become leaders. The group had so many questions and it was the first time I realized I have the ability to inspire. 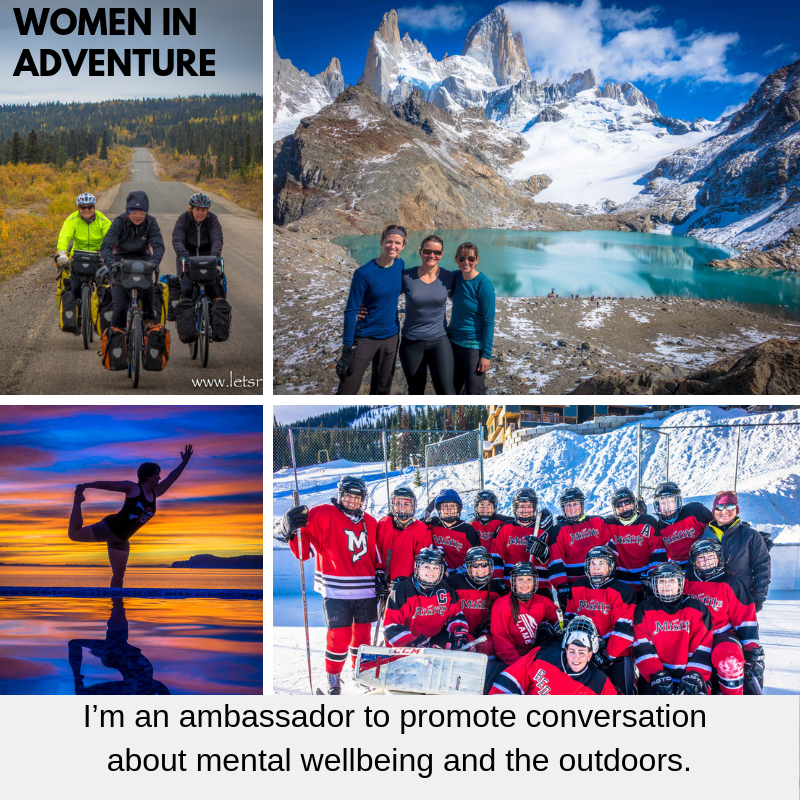 Fast forward to 2017 when I was contacted by Women in Adventure and participated in a study of the link between being outside and our mental health. I’m proud to say I’m featured as someone who has a compelling story to share that can inspire others. I am mindful that I have the opportunity and responsibility to impact others positively by sharing my story. I’ve been fortunate to have amazing women in my life; some for years and others long enough to have a lasting impact. With these meaningful impressions combined with my journey, I have a duty to act as a responsible advocate and continue to participate actively by opening and encouraging conversation and motivating positive change. So check out the results of the survey https://womeninadventure.com/advice_inspiration/ and get outside! Interested in who is in the featured image? The first picture of the three cyclists is myself, and two women we met early in our journey almost five years ago. Esther and Claire are sisters and we had the privilege to cycle with them for a couple of days in Northern Canada. We’ve actually had the honour of seeing Esther in a few more countries over the years. For me these two women stood out as strong, confident and they reminded me that, yes we can do this and it rocks! I’ve learned over the years that there are very few women long distance cycling. The next two women I’ve met in the last month and they too have made a lasting impression on me. BeBeth and Alissa come from different backgrounds and lifestyles and here they were on the Carretera Austral in Chile and Argentina cycling some of the hardest roads we’ve seen across the Americas. They used to work together and see each other infrequently. Their common thread; they like to be active outdoors. So with having spent little time together before their journey they took a risk and flew to South America together for two weeks. We had the pleasure of hanging with them for many days and they reminded me that no matter what your experience or background, you can tackle anything and have fun. As a bonus we got to hang out with Alissa for a few extra days at the end of the planet (which I can now confirm first hand … it’s not flat). The bottom left picture is one you’ve seen before of me practicing yoga in one of my favourite spots in the world so far; San Carlos Mexico. I began my meditation and yoga journey in 2014 and I’m fortunate that my current lifestyle allows me the time to focus my energy and centre myself. While my focus can waver like most of us, last year I had the privilege of being oceanside where there is a profound sense of calm and positive energy. And my final picture is of my sisters from another mother and father; my Misfits hockey team. This is a group of women that no matter the distance, the time spent apart or any circumstances; we are always there for each other. I know that no matter what happens in life, I’ve got my Misfits. And to all the other women in my life especially my sisters who are awesome; thank you for being part of my life. Don’t get me wrong, guys are cool too but women are different. Such an interesting read Amanda-and yes women are different- so in tune to our inner selves and our journey in this wonderful world! And the great thing about men is their ability to recognize this and tune in to it….Happy Spring has arrived in BC!